Ghost stories, on the printed page, on the silver screen, on the tube, I’ve always been drawn to them. I developed a taste early for black-and-white horror films, from The Haunting to The House on Haunted Hill (the original, not the remake, in both cases). You may recall that I have issues with allegedly scary movies that aren’t. (A blog about less than scary stuff I've seen.) I tried again this weekend, viewing a period piece with cinematography that sometimes appeared almost black and white, but wasn’t — cinematographer Tim Maurice-Jones’ rich tones made the blacks blacker and the grays deeper, with some luscious browns in addition. Visually, this ghost story was exactly as advertised. 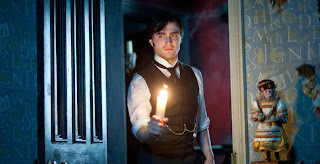 Daniel Radcliffe as Arthur Kipps at the gates of the haunted house. 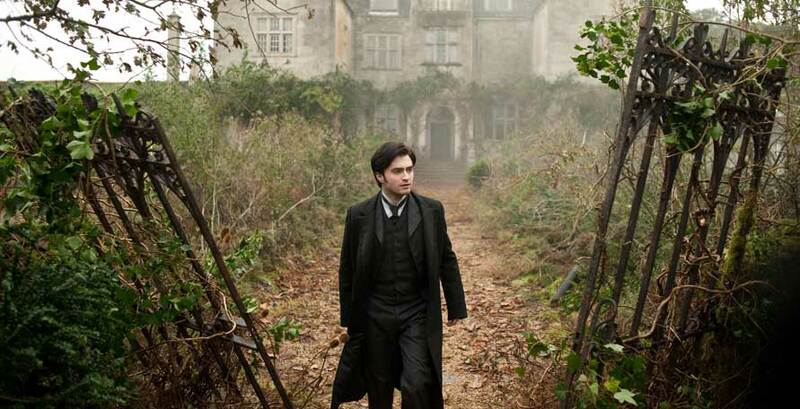 I’ve enjoyed the build-up and trailers to The Woman In Black. And I’m rather surprised but happy to report I enjoyed the film as well. This is an unambiguous ghost story, sure of itself. Its color scheme lends to a time when Nature ruled us and we had no inkling yet that we might try to rule Her. Candles light houses, headlights are weak, and the amazing combustion engine is something that no one has had before to potentially uncover truths ― and skeletons ― in this mad haunting. First, adults are stupid. That’s not about the movie, but I ask you, if you saw the advertisements for this film, where there’s a scary lady and a number of dead children, would you bring children? A five year old? The woman behind me brought a gaggle between five (at most) and nine. These children may not have gotten this film while they watched it, snuffling and slurping and crunching and whispering that they had to pee. But tonight, or tomorrow night, or the night after? I predict there will be nightmares and the stupid adults won’t understand why. Second, this film is visually awesome, from the close-ups to the long shots, the darkness that is barely touched with light. Shadows frighten even as they woo us toward their peculiarly warm depths. Director James Watkins and cinematographer Maurice-Jones seduce us with a watercolor palette in a brightly lit opening scene of innocents at play. Then the tones turn to moody oil paints. Kudos to set decoration by Niamh Coulter — the child’s nursery is the creepiest room I’ve ever seen. All those Victorian wind-up toys and gewgaws may seem like mere clutter, but those bulging eyes engender dread and terror. 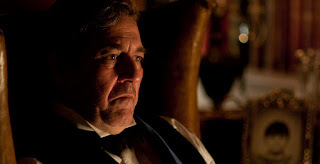 The Woman in Black has fabulous production design (Kave Quinn) and art direction (Paul Ghirardani), as well as brisk film editing (Jon Harris). Third, the premise works pretty well — most haunted house stories start off at a disadvantage with a ridiculous reason given for staying in the psychologically and physically threatening place. Here the protagonist actually has good cause to determinedly push on to this unpleasant wreck of a house to find all the papers hidden there — and they are indeed hidden without rhyme or reason throughout the house. The death of the last inhabitant was allegedly recent, but the estate has been falling into ruin for a good many years. 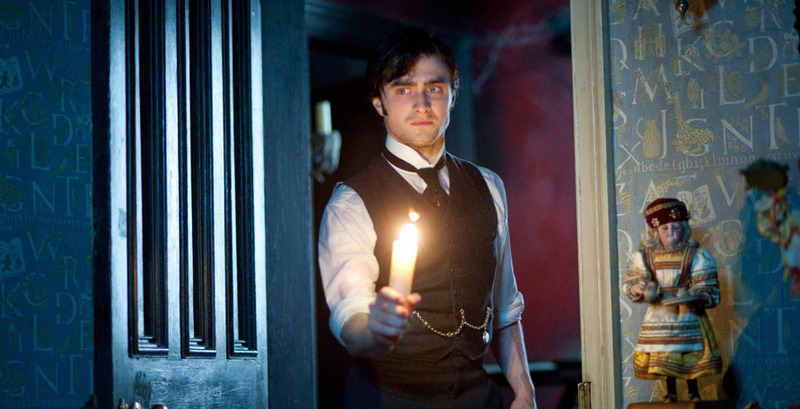 The rather desperate plight of the protagonist, Arthur Kipps, attorney, is set up well, and, rather like the decrepit house, Kipps has been grieving for his dead wife for four years and probably wouldn’t care at all about his debt and looming job loss but for his four-year-old son. He must do this unpleasant task or face whatever English debtors face in the time between the Boer War and the first world war. How do we know when this takes place if we’re not experts about the single automobile seen? As Kipps reads The Evening News on the train north (Daniel Radcliffe may never escape long train rides north), we see an ad about spiritualism and a medium endorsed by Arthur Conan Doyle. That would place the story after the Boer War. Everything else (clothing, candles instead of electricity or even gas lights, horse-drawn vehicles) definitively places the story earlier than World War I. Fourth, the performances in this film across the board are first rate. Really. 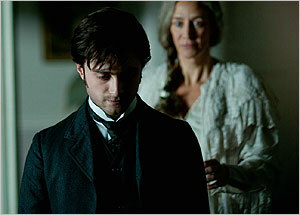 Daniel Radcliffe’s first foray into a feature film as an adult tells us that the boy’s still got it. As young attorney and widower Arthur Kipps, his big blue eyes are woeful, his face lights up with amazed joy then crumples in bewildered despair. Arthur is running on fumes, but Radcliffe is not. He took the chance of doing a ghost story and carries it well. He’s not yet a powerful player in the adult arena, but he’ll get there. The last few times I’ve seen Ciaran Hinds, I considered him miscast. At last, in this film, it’s a fine fit as wealthy landowner Mr. Daily, the only man in the village with an automobile. He is a sturdy, certain, god-fearing and loving man, who has suffered loss but still reaches out to help a stranger. The great Janet McTeer plays his wife. She’s a little bit off, perhaps way off, but anyone who stays in this god-forsaken village is likely to be. McTeer is delightful and fearless, her Mrs. Daily as loving to her “twins” as she would wish to be to her dead son. The people in this town are unpleasant. They lie, they stare, they close doors on poor Arthur, they’re downright mean. Then we remember the opening scene of the film — one of very few in bright daylight, in which three pretty little girls interrupt their tea party. They look in unison toward something we cannot see, then turn to look at the windows. They go to the child-size windows, and….I don’t need to see the result, it’s searingly bright and horrific. It’s an affecting and shocking scene in which there is no blood or gore. Blood and gore aren’t scary, they’re just gross. Director Watkins and screenwriter Jane Goldman (based on Susan Hill’s novel of the same title) get the horror genre better than many. Together they create simple, sharp scenes with multiple characters; then long silent scenes with Arthur alone. Or is he? The villagers are not caricatures, even though we can think of them as the Innkeeper, the Innkeeper’s wife, the Lawyer, the Lawyer’s wife, the Cart Driver, the Landowner. These may sound like stock characters, but the acting makes these people individuals instead. This is a village of the damned. All the people of the village are extremely well played, from Tim McMullan as the local lawyer Jerome and his wife Cathy Sara, to David Burke as the Constable. Daniel Cerqueira as Keckwick the cart driver is surly and closed off. But he has a name. Later Arthur will call his name in the mist, in the dark. Keckwick is an echo of the whole village. Liz White as Jennet, the Woman in Black, is haunting and haunted as she wreaks havoc and revenge against anyone and everyone. The unfriendly Innkeeper and his wife, the Fishers, are well played by Shaun Dooley and Mary Stockley, each dealing with their losses differently. 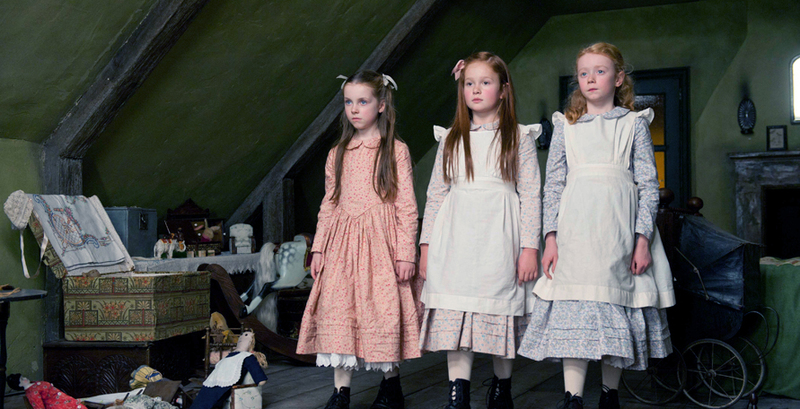 Not to mention the exceedingly creepy children, particularly Aoife Doherty as Lucy Jerome and the children we meet first, the Fisher girls, Emma Shorey and Molly Harmon. The acting in this film is terrific and that makes it a lot of fun. 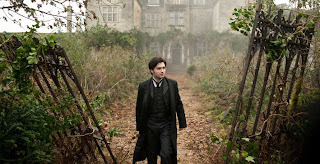 All in all, I enjoyed The Woman in Black: It brings Hammer Films into the 21st Century with a hoot and a holler, and I had a few good frights. I would have enjoyed it more had the children behind me been off watching “Hugo” where they belonged. When The Woman in Black is on DVD and I can control the viewing space — that is, the only juveniles behind me will be cats — I think I’ll enjoy it more despite the smaller screen. After all, my current television screen is much larger than the old TV screens on which I saw many a memorably frightening film. Hm, I had been wondering if this flick would be worth seeing in a theater. You have convinced me that I should!